Dr..D.S.Ramachandra Murthy was born in 1947 in Chennai. Graduated in Civil Engineering from Dr.Alagappa Chettiar College of Engineering and Technology, Karaikudi, and obtained post graduate degree in Structural Engineering from the College of Engineering, Guindy, University of Madras. Obtained Ph.D. degree from Anna University in the area of Corrosion Fatigue. Served as Junior Engineer (Design) at Tuticorin Harbour Project, Ministry of Shipping and Transport, Govt. of India, for 16 months. Joined CSIR – Structural Engineering Research Center, Chennai, in 1972 and retired as Director Grade Scientist and Advisor (Management) in 2007. Served as Professor and Dean (R&D) at St. Peter’s Engineering College (conferred deemed University status in 2008) and as Principal, St. Peter’s College of Engineering and Technology (SPCET). Officiated as Vice Chancellor, St. Peter’s University during 2012-15. 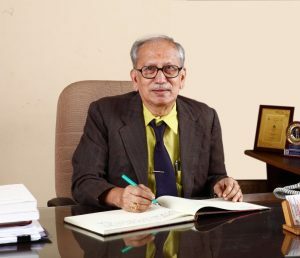 Being an accomplished Scientist of CSIR, Dr.Murthy undertook research projects in the areas of Fatigue and Fracture Mechanics, Steel Offshore Structures, Nuclear Piping components, Housing and Prefabrication, Precast and Prestressed concrete, and advanced concrete technologies. He has untiringly worked to contribute to the needs of the society and industrial development through research and transfer of technology. His major contributions are: creation of a world class facility for Fatigue and Fracture studies at SERC; development of expertise in fatigue and fracture mechanics analysis and testing of full scale components and structures demonstrated through important projects for the Government Departments, industry and MNC. Carried out pioneering research on corrosion fatigue in steel offshore structures in India and evaluated performance of steel offshore structures, automobile and railway components for several industries. Contributed for production technology for precast prestressed concrete monoblock railway sleepers. Organized national and international seminars, workshops and training programmes for dissemination of advanced knowledge. As Dean (R&D), Dr.Murthy initiated M.Phil. and Ph.D. programmes at St. Peter’s University. He also initiated SPIHER – MSME Business Incubator sponsored by the Ministry of Micro, Small and Medium Enterprises. As Principal at SPCET, he contributed to the development of the nascent institution by motivating faculty and students, and creating necessary infrastructure for achieving high academic performance; conducted several technical programmes including advanced manufacturing technology, disaster management and health monitoring of structures, and two science camps for school students under the Inspire programme of the Department of Science and Technology, Government of India. As Vice Chancellor at St. Peter’s University, Dr.Murthy motivated faculty and students to achieve academic excellence, high quality research and industry interaction through MoUs with leading research institutions and industries. Several project proposals were prepared for grant. Ten projects were sanctioned under the SPIHER – MSME Business Incubator. Dr. Murthy was deputed to Sweden, U.K., Czechoslovakia, and U.S.A., under UNDP Fellowship Programme for 12 months during 1976-77. Served as short term UNCHS Consultant at Building Research Institute, Kingston, Jamaica, during 1986. Deputed to MPA (Staatliche Materialprufungsanstalt), University of Stuttgart, Germany, under CSIR-DAAD Exchange of Scientists Programme in 2001. Dr.Murthy’s work has been published as 185 technical papers including 64 in International and National journals, and 19 books/proceedings. He has mentored four Ph.Ds and guided several M.E./M.Tech research dissertations. He served as Editor for Journal of Structural Engineering and Member, Editorial Board, International Journal of Fatigue and Fracture of Engineering Materials and Structures. He is also reviewer for two international journals. He won 12 awards for technical papers and a national award from NACE International India Section, Corrosion Society of India. Dr.Murthy is a Fellow of The Institution of Engineers (India) and Life Member of the Indian Concrete Institute and the Indian Society for Non Destructive Testing.